Lis Pendens is Latin for "Pending Suit" A Lis Pendens is generally filed by the plaintiff. A Lis Pendens is a notice of litigation filed with the Recorder of Deeds to put third parties on constructive notice that a property interest is involved in pending litigation. Constructive notice means that people will be treated as if they had notice of the pending legal action. A Lis Pendens will show up in a title search, letting would be buyers know that there is pending litigation and if they purchase the property, they would be subject to the outcome of the litigation. In Washington, DC, lis pendens are governed by statute: DC 42-1207. 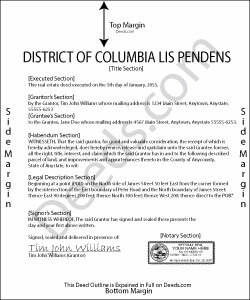 In the District of Columbia a Lis Pendens must contain this information, ref 42--1207(b). (8) Description of the real property sought to be affected. Once completed a Lis Pendens becomes effective when it is recorded at the Recorder of Deeds Office. Quiet Title Action: This could protect the plaintiff if a third party is trying to purchase the property from the defendant before the suit is settled. Mechanics Lien: In DC, a lawsuit to enforce a mechanic's lien must be brought within 180 days following recordation of the notice of lien, otherwise the lien is terminated. The contractor must also file a notice of pendency of action (lis pendens) with land records within ten (10) days of filing the lawsuit. See DC ST 40-303.13. Divorce Proceeding: Typically used when the name of the property is in one person's name only. This could prevent that person from selling the property before the divorce settlement. Foreclosure: When the lender files a notice of suit, a Lis Pendens is also filed. The Lis Pendens notifies all who may have an interest in the property of the pending lawsuit.